Josep Gombau named an expected side for his first competitive match, with his two new compatriot signings, Isaías Sánchez and Cirio, starting as a deep-lying midfielder and left winger respectively. Michael Zullo also made his Adelaide debut, at left-back. It wasn’t a ‘pure’ 4-3-3, however, and the roles of the midfield trio were interesting: Carrusca got into good positions between the lines and linked up nicely with the wingers on either side – and out of possession, he (or sometimes, Lustica) pushed up alongside Jeronimo, and the “second function” midfielder stayed alongside Isaías, almost so that it was a 4-4-2 shape. Alistair Edwards, meanwhile, gave a start to Brandon O’Neill in central defence, with the rest of the side as predicted in a 4-2-3-1 formation. Without the ball, the two banks of four dropped to halfway, pressing when the ball was played into their half. Both sides have pledged to progress towards more modern, attractive football this season, but Adelaide were more clinical and cohesive than their counterparts. Unsurprisingly, then, he started with a 4-3-3, where the midfield pointed as such that Isais Sanchez was positioned betweeen the lines of midfield and defence. That aligned neatly with the Glory’s 4-2-3-1, where the midfield triangle is tilted in the opposite direction – so that Ryan Edwards was playing in support of lone striker Jamie MacLaren. That proved crucial in the scheme of the match, as Edwards asked his son to man-mark Isaías out of possession. In theory, it was a reasonable decision, as in a ‘Barcelona’ 4-3-3, the deepest midfielder drops into defence and is perhaps the most important player in terms of retaining possession. With the rest of the side sitting deeper in two banks of four, Edwads’ main concern wasn’t with competing for possession – it was simply about stopping Isais from setting the tempo of Adelaide’s possession play. And while the Spaniard recorded a relatively low number of passes and, always closely tracked by Edwards, rarely received the ball facing forwards, it was to the benefit of the two central defenders. MacLaren couldn’t cover the distance between both of them, and Nigel Boogard and Jonathon McKain enjoyed great freedom in possession, frequently striding forward into midfield to hit passes into the attackers between the lines. They finished as easily the game’s most frequent passers. The disconnect between Perth’s front two and the ‘back eight’ (the two wingers dropped alongside the two central midfielders) meant Adelaide’s central defenders weren’t pressured until they reached half-way – and as the responsibility for closing them down fell to the pivot players (Steven McGarry and Jacob Burns), pockets of space naturally opened up in behind for the two advanced midfielders. Adelaide always looked to get the ball to a player between the lines, whether it was Carrusca, Lustica, Jeronimo or one of the wide players. The first goal is an excellent example of this – Boogard brings the ball forward, McGarry is drawn towards him, so Jeronimo drops into the space the Scotsman vacated, plays the ball out wide and then drives forward to provide the finish. It was a similar build-up for the second: Boogard starts the move, but this time the passage of play ends with Cirio on the left, who duly assisted Jeronimo’s second. On a side note, it was interesting to observe Cirio for the first time – he was originally touted as a goalscoring left winger, then played as a false nine in pre-season, but here, he kept wide positions in possession and then attempted to take defenders on the inside. However, when the ball was on the opposite side with Ferriera, Cirio moved into goalscoring positions at the back post – this was obvious for the third goal, with Ferriera getting in front of Scott Jamieson to meet a left-sided cross. 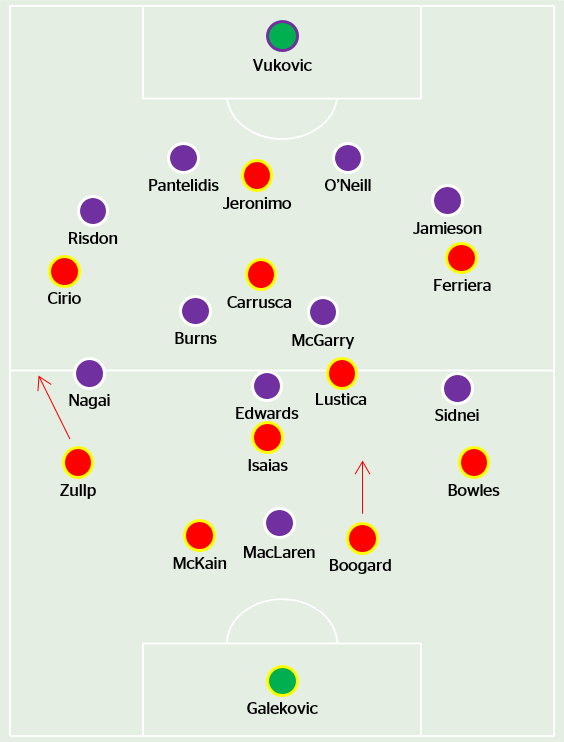 In contrast to Adelaide’s more patient build-up play, Perth played fairly direct – like how Melbourne Heart hit quick forward balls into the channels for their quick wingers, there were lots of attempts to play Ryo Nagai and Sidnei Sciola in behind the full-backs. As noted in the preview, both foreigners are excellent in one v one situations, but the majority of Perth’s passes over the top were inaccurate. There was only one real moment where they managed to get one of the wingers dribbling directly towards goal: when Sidnei dribbled past three defenders and MacLaren could’ve done better with the finish. The Brazilian provided the assist, but from a quick set-piece, and it wasn’t symptomatic of his wider ineffectiveness. It didn’t help that Edwards had to track Isaías out of possession – it meant when the ball was turned over Adelaide’s holding midfielder was already close to him, which closed off the passing angle. Somehow, though, the game descended into a stop-start affair, punctuated by frustrating fouls and yellows that disrupted the tempo of the match, and Adelaide remarkably lost both Isaías and Boogard to reds. The former’s dismissal was a silly piece of timewasting, but Boogard’s lunging challenge on Da Silva was perhaps indicative of the inherent risk in Gombau’s strategy – by asking the side to play with great width and the central defenders to split wide out of possession, the chance of them being forced into a desperate last-ditch tackle is increased. Gombau reacted by pulling Ferriera, and sending on Tarek Elrich, a versatile right-sided player who offered more protection defensively in a reshaped 4-4-1 formation. It was useful that Steven Lustica had earlier been substituted for Osama Malik, who was a more solid, physical presence in midfield. It took Edwards a few moments to react, by pulling McGarry and introducing Da Silva, inverting the midfield triangle so that Burns was now a lone holder. It was a positive move, and indirectly lead to the second dismissal, but it didn’t palpably improve Perth’s attacks – aside from a few moments, they struggled to break down Adelaide’s now compact, defensive 4-3-1. A Barcelona-schooled coach would prefer to have closed out the match through possession rather than pragmatism – but Gombau will appreciate an opening round win, and the promising signs of fluency in attack. It was good to see that they could circumvent the problem of Isaías via the centre-backs, and that they could drop into a more defensive shape with nine men – they may seem like simple things, but it shows a flexibility that some feared may have been absent from Gombau’s tenure.